When you add an Item to an Invoice, the tax that appears depends on two factors: the Tax Type the Style (and therefore the Item) belongs to, and the Tax Zone. You can choose in Station Configuration whether you want to take the Tax Zone from the Store or from the State the Customer belongs to. This gives you maximum flexibility when selling merchandise that is taxed differently in various jurisdictions. Before you begin selling at the POS, you need to fill out the Taxes Catalog. 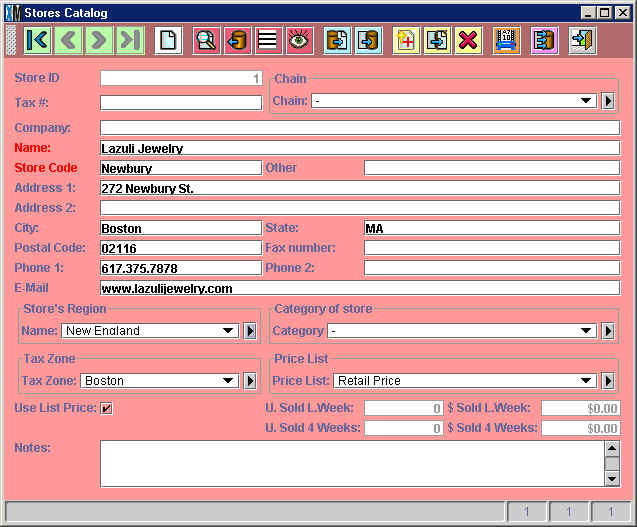 To begin with, every Style must be assigned to a Tax Type in the Styles Catalog. Since every Item "belongs" to a Style (see the Relational Nature of the Data topic) every item belongs to a Tax Type. For example, some merchandise will belong to the Sales Tax type and others will belong to the Tax Exempt type. You need to have one entry in the Taxes Catalog for every combination of Tax Type/Tax Zone and you must enter the tax rate (expressed as a percentage). If you have two Tax Types (Sales Tax and Tax Exempt) and three Tax Zones (Boston, New York and Hartford) then you need to have six (2 x 3 = 6) entries in the Taxes Catalog. Now that you've setup the Taxes Catalog, XpertMart™ will automatically add the tax to an Invoice and the tax rate will depend on the Item being sold and the Store it is being sold in. This way the exact same pair of shoes might be taxed, for example, at 5% in Boston, 8% in New York and 3.5% in Hartford. There is no limit to the number of Tax Types you can have in the Tax Type Catalog. Usually these are a function of the number of tax types the local authorities have created. Most of the time you need at least two entries: a Sales Tax and a Tax Exempt. However, if different merchandise is taxed at different rates, then you will likely want more specific entries such as: Shoes Sales Tax, Hats & Belts Sales Tax, Clothing Sales Tax and Tax Exempt. You will need to create a separate entry for every jurisdiction where you are running a store that has a different tax rate. In some countries, such as Mexico, there are only two tax zones: one for border reagions and one for the rest of the country. In the US, however, tax rates can vary from town to town. If you have a total of five stores and three of these are subject to different tax rates, you will need to create three entries in the Tax Zone Catalog. In some cases, certain customers do not have to pay a tax on merchandise being bought. This is most commonly the case with sales by phone, Internet or mail. In the United States where sales tax is charged at a state level, any customer buying from a different state does not have to pay tax on the purchase. If this is the case, make sure you've checked the Tax Exempt checkbox in the Client Catalog for the customer in question. When you enter a tax exempt customer into an Invoice, the total tax will be $0, regardless of the Tax Type of the Item or the Tax Zone of the Store. (It is like multiplying the tax by 0). If the customer buying the merchandise is not tax exempt but the "Ship-To" customer is, then the tax will be $0. (In this case the customer lives in-state but is buying merchandise as a gift and is shipping the merchandise to a customer that lives out-of-state). Some jurisdictions, for example in Latin America, Europe and Canada, use a Value-Added Tax (VAT). A VAT is a tax that is automatically added to every transaction, at every step in the value chain. Most of the time prices already include the VAT. Usually retailers will have to pay a VAT on the merchandise they buy and then charge a VAT on the merchandise they sell. Periodically they will then have to pay the difference between the VAT they collected and the VAT they paid out. 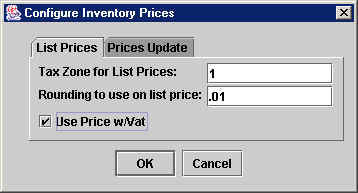 XpertMart™ can be configured to run in VAT mode (see next section below).When you run in VAT mode, all prices that are displayed will already include the VAT. 3) In Catalogs>Taxes>Tax Zones catalog, make sure the check-box named “VAT” is selected. Once you have done these steps, exit and reenter XpertMart™ for the configuration changes to take effect. To switch out of VAT mode, follow the same steps only this time deselecting the configuration options.